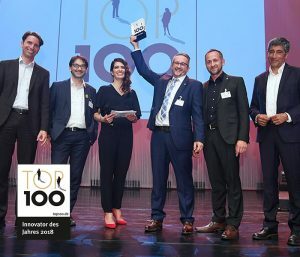 We are pleased to announce that our long-term High Precision Thermoregulation Manufacturing Partner – Huber, have successfully defended their title, for the second year running, to win the coveted “Innovator of the Year 2018” title. ze class C – which is for companies with more than 200 employees. ‘Huber succeeds in managing the tension between openness and flexibility as well as the necessary clear structures in an exemplary manner. The distinctive, innovation-oriented way of thinking and acting influences both technology development and product design as well as internal and external relationship management.